Such hospitality is remarkable for the region. Further north in Syria and Iraq jihadists have uprooted ancient Christian communities and torched their churches. Neighbouring Saudi Arabia still bans churches and Christmas trees. 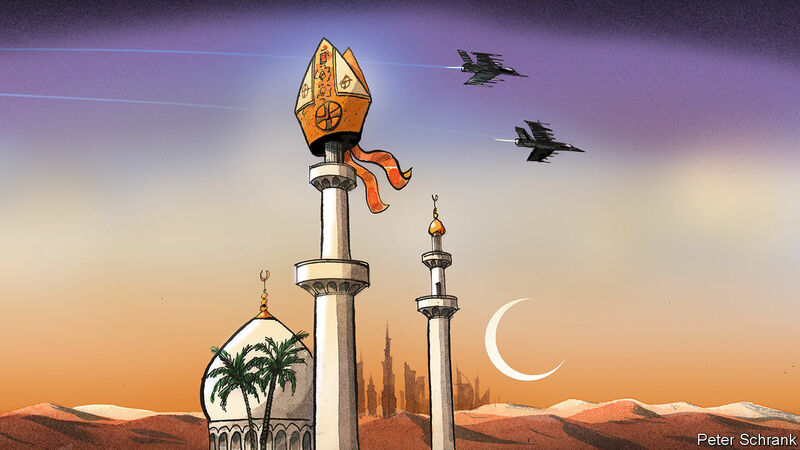 “Two religions shall not co-exist in the Arabian peninsula,” snap the Koran-bashers, quoting a saying of the Prophet. Pope Francis appears to prefer Prince Muhammad’s strand of the faith. In an interview in 2016 he warned against the export of an “overly Western model of democracy” to the Middle East. Unlike his predecessor, Benedict XVI (who upset Muslims with a quote about the Prophet Muhammad’s propagation of the faith by the sword), Pope Francis has reached out to Muslims who seem to be tolerant. A quarter of all his papal visits have been to Muslim-majority countries, but he has rarely spoken out against their autocrats.